Grilling season has finally arrived! 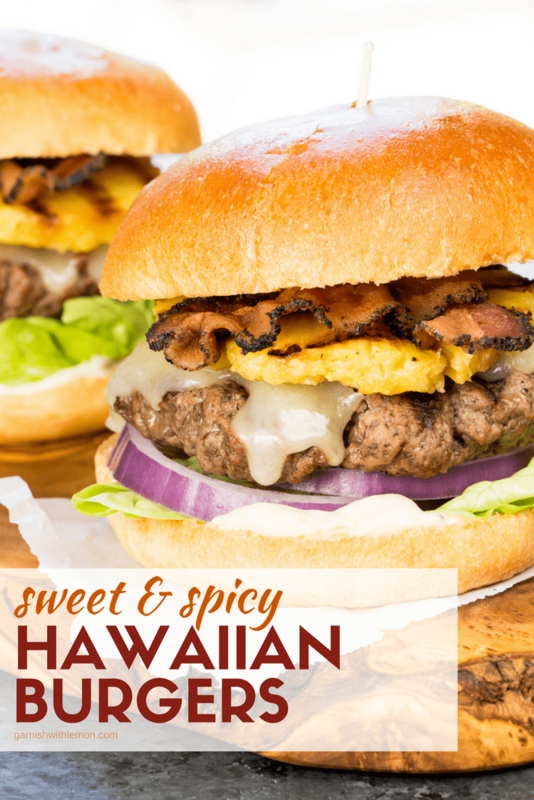 Celebrate the start of summer with this recipe for mouthwatering Sweet & Spicy Hawaiian Burgers. Can you ever have enough burger recipes, especially in the summer? We’re adding to our burger arsenal today just in time for Memorial Day cookouts. These Sweet & Spicy Hawaiian Burgers are sure to be the star of your next BBQ. What exactly are Hawaiian Burgers? 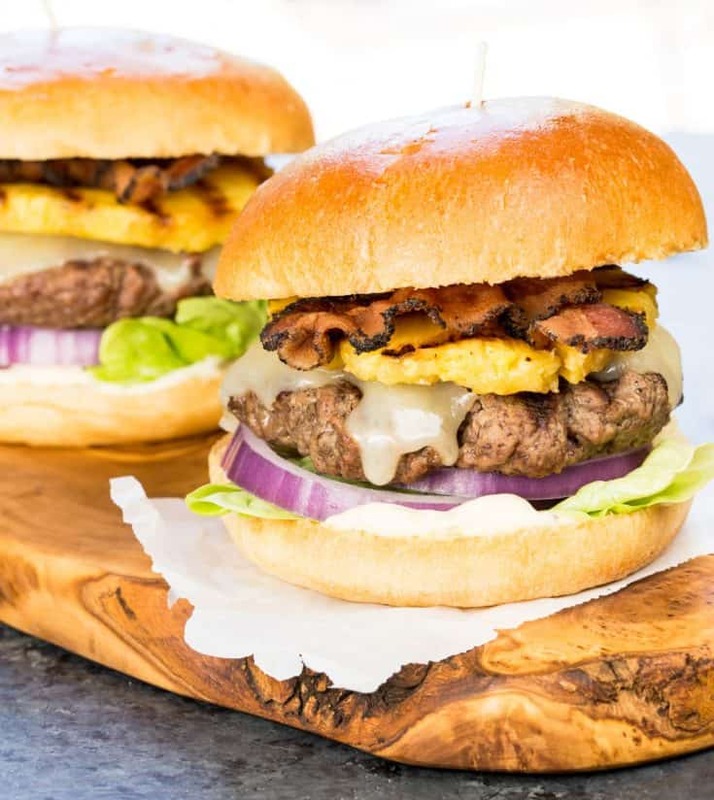 Interpretation may vary, but we’ve crafted a Hawaiian-inspired burger recipe that combines the flavors of sweet, grilled pineapple and a savory garlic teriyaki sauce. My kids (and even Pat) were a little bit leery of pineapple on their burgers, but that trepidation quickly disappeared after they tasted how well it works with the peppery bacon and garlicky teriyaki mayo. A quick sear on the grill naturally caramelizes the sugars in the pineapple and makes even slightly unripe or tart fruit taste mellow and sweet. Lightly oil the either the grill grate or the pineapple rings to ensure they don’t stick when cooking. Keep your heat around medium and grill for about 3 minutes per side or until lightly charred. Feel free to grill the pineapple in advance if you like. Simply cool the rings completely and then store in the fridge until ready to use. I like to bring my pre-grilled pineapple rings to room temperature before serving so they aren’t too cold on my hot-off-the-grill burger. 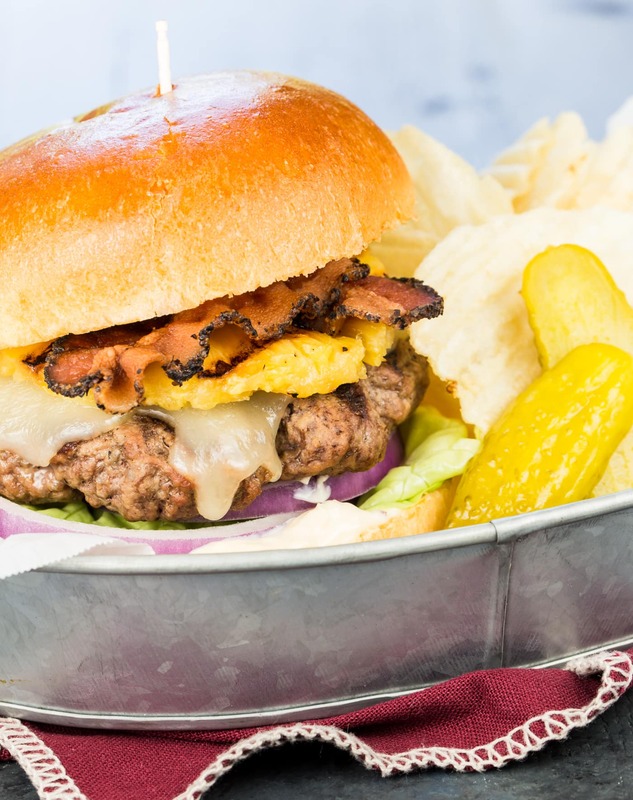 There are few things more all-American than burgers, and this Sweet & Spicy Hawaiian Burgers recipe will help you kick off the summer barbecue season in tasty, tropical style. Looking for more burger love? We’ve got some delicious burger recipes for all of your summer grilling! Preheat the grill to medium high heat. Season beef patties with salt and pepper. Lightly grease grill rack and cook burgers 5 minutes, flip and cook for another 3 minutes or to desired degree of doneness. Place cheese slice on each patty and cook for another 30-45 seconds or until almost melted. Remove patties from grill. Slather garlic teriyaki sauce on bun bottom. Layer bun with lettuce leaf, red onion, burger, bacon and pineapple slice. Stir together all ingredients until smooth. Refrigerate until ready to use. Never grilled pineapple before? It's easy! Evenly slice pineapple into rings. Lightly grease grill grates and cook over medium high heat for 2-3 minutes per side or to desired degree of doneness. The conference sounded like so much fun–wish I was there with you! But these burgers–incredible. Beautiful photos ladies, and I’m LOVING the beef, bacon and pineapple combo. Cheers to summer! Right back at ya, Lauren! I just purchased a fresh pineapple. I know I’ll be trying this! Yum. Pinned for later, thanks for the recipe. That conference sounded amazing! I just came back from one too. Loving these burgers and that pineapple combo!! These look so delicious they bring me back to those fantastic sliders! So fun to have the time with you two. It was a great time. And lucky me – I get to see you again in just a few more weeks!